As you might already know, Canadian gardening expert Mark Cullen is this year’s celebrity guest birder for the Baillie Birdathon. And today is the day he’s doing his Birdathon, at Tommy Thompson Park in Toronto — more information on this below. So I was very excited back in February or March when I found that Mr. Cullen was going to be the special guest speaker for our local Spring house and garden show — I thought it would be great to meet him and talk to him. And then I found out that it was going to be on the same day as the Snow Goose Chase (Saturday, April 27th), so I wouldn’t even be around! My mother helped me brainstorm, and I ended up writing to Mr. Cullen to see if I could meet him a bit earlier, maybe the evening before, and interview him for my blog. As it happened, he was going to do another event for our town the day before, and so we planned to meet on Friday at 5 pm. But then in mid-April I got the bad news that the Friday event was cancelled and Mr. Cullen wasn’t sure what time on Friday he would be arriving. And we had to leave home around 8 am on Saturday morning to get to Tofield in time. Drat! Mr. Cullen was so wonderful and accommodating, agreeing to meet me at 7:30 in the morning on Saturday, and we had a nice talk; my parents were there too. He gave me some bookmarks to hand out at the Snow Goose Chase, and gave my mother some vegetable seeds for the garden! I followed up by sending him my interview questions by email. Of course, this is his very busy speaking and gardening season, but I will have that interview on my blog as soon as he’s able to send his reply. As a third-generation career gardener, I don’t think I’ve ever encountered a hobby gardener in this country who does not consider themselves an amateur birder too. Merely observing the activity around my 12 garden feeders convinces me that birds are as essential to the outdoor human experience as trees, water, and fresh air. And as you know, the presence of diverse and abundant birdlife is one of the most visible signs of a healthy environment. Mr. Cullen is doing his Birdathon today, May 14th, at Tommy Thompson Park in Toronto, which was selected as a globally Important Bird Area (IBA) by BirdLife International in 2001. He’ll be birding with Mr. Love and my friend Jody Allair from BSC, whom I got to know last year at the Young Ornithologists’ Workshop (Jody is a huge supporter of the Baillie Birdathon and also contributed to my own Birdathon — thank you again, Jody!). So far Mr. Cullen has raised $3,055 and the first $5,000 raised will be matched by a generous anonymous donor. 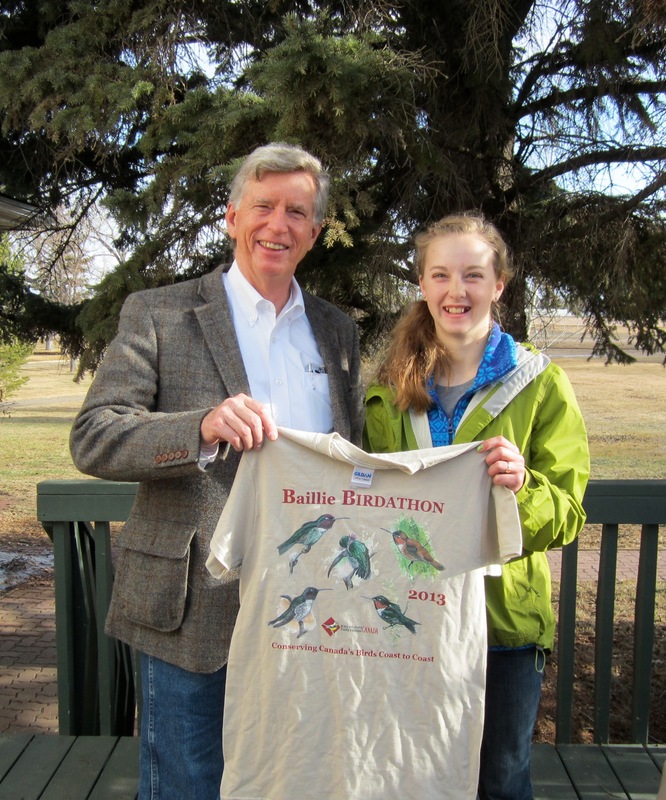 Here is his recent blog post on the Birdathon. As I write this column from my home office, I am keenly aware of dozens of visitors in my backyard. My nine bird feeding stations are in clear view and they are very popular today. Juncos, chickadees, downy woodpeckers, a European grackle, and a mom and dad cardinal are all gorging themselves like they have not seen food all winter. From time to time, a blue jay arrives to scoop up an unshelled peanut, cawing an announcement to his buddies that there is a feast to be had at the Cullens’ place this morning. There is barely a hobby gardener in this country who does not consider themselves an amateur birder, too. That is not to say that all gardeners feed the birds intentionally, but we do have an inherent appreciation for the qualities that they bring to the outdoor experience. Birds find the work of the gardener helpful even when that is not our primary intent. Plants provide protection, nesting areas, and, of course, natural sources of food for native birds. A garden pond provides a drink, a bath, and for some bird species, another source of food. Condo and apartment dwellers should not feel left out. A balcony garden can provide all the aforementioned benefits regardless of how high up you reside. And that’s really what it’s all about — making sure we preserve Canada’s birds to illuminate our outdoor experience. Thank you, Mr. Cullen! This entry was posted in Alberta Birds, Bird Conservation, Birding, Birding Events, General Birding, Great Canadian Birdathon, Spring and tagged Great Canadian Birdathon, Interview, Mark Cullen, Snow Goose Chase. Bookmark the permalink. A very inspiring story. Make sure you post that interview, now! I will, Annie! As soon as I get his replies, I’ll be able to write up my post!